ISO 11446 details the connections and standards used in the 13 Pin Trailer connector. The connector was developed in the late 80’s by Erich Jaeger as the demands of the automotive industry required additional electrical circuits to be connected to trailers. They are sometimes known as “Jaeger” connectors – especially in Europe. ISO 11446-1 13-pole connectors for vehicles with 12 V nominal supply voltage not intended to cross water fords. ISO 11446-2 13-pole connectors for vehicles with 12 V nominal supply voltage intended to cross water fords. The above is decoded as Standard 11446 Part 1 dated 2012 revision 05. If it is ‘draft’ or ‘proposed’ it will always state this after the revision number. When ever you are having a tow bar fitted with towing electrics it is important that you always choose either ‘OEM’ (electrical kit produced by/for the vehicle manufacturer for your specific vehicle) or “vehicle specific” (electrical kit produced by an independent supplier specifically for your make and model of vehicle) and check it is fully ISO 11446-1:2012 compliant. It is not recommended to install a “generic” electrical towing kit that is simply wired into the vehicles electrical system. Although it will seem cheaper at the time, in the long run it could cost you a lot more in revisiting the installer and fault-finding. In fact most manufacturers now state that installing a non manufacturer approved electrical towing kit will invalidate any vehicle warranty and could compromise any on-board vehicle electrical safety systems. Unfortunately some vehicle manufacturers (OEM) and vehicle specific electrical towing kits are not fully compliant and do not include connections for the fridge (Pin10) of charging the leisure battery (Pin 9). Notably BMW, Audi and Volkswagen seem to produce kits that are not fully compliant. Additionally if you have an independent auto electrician install a towing electrics kit, you must ensure that it is fully compliant with the ISO standard AND the vehicle manufacturers specifications – which could include a software update to the vehicles ECU so that the vehicle on board systems (ESP, ABS & Trailer Control) are activated and functioning correctly. Some vehicles use the trailer grounding Pin 12 to signal to the vehicles ECU that a trailer is connected. The ECU uses this information in various ways – to change the ABS settings, alter the ESP programme and mute the reverse sensors (if fitted) along with on some vehicles turn off the rear fog lights on the vehicle. It is important then that you do not make any modifications to the trailers electrical system that affects the ground connection between Pin 12 and Pin 3 on your trailer. (NOTE: some pre 2012 caravans/trailers that use the 13 pin plug will not have implemented this, if you have just changed to a new tow vehicle, it is worth checking if your vehicle needs this and that the caravan/trailer is suitably wired). 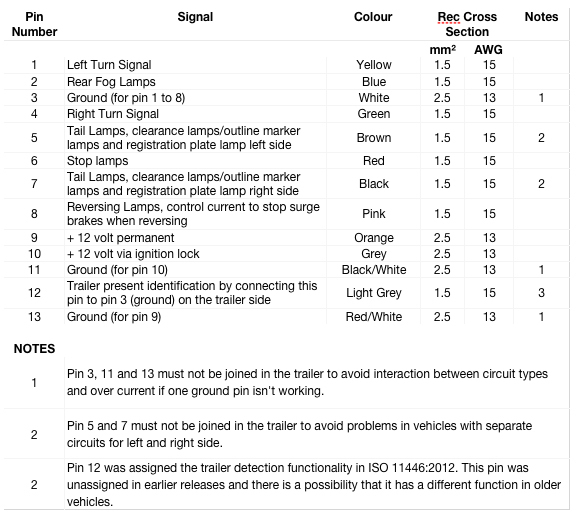 Some vehicles do not use pin 12 to detect if a trailer is connected, they detect the presence of a trailer by sending signals via the CANBUS system to detect if trailer lights are present on the 13 pin towing socket. Its worth finding out how your vehicle detects the presence of a trailer. Because of Copyright rules on the official standards document, I cannot reproduce it here in full and if you want a copy you have to pay nearly £100 for all 14 pages of it. I can understand making some charge – say around £5 to £10 for an electronic version, the current charges though are just silly. However I hope the above gives you enough information. There are two separate 12 volt supplies to your fridge. The first provides power to operate the gas valve, power the interior light and power the LCD display on fridges fitted with these and is provided by the leisure battery. The second 12 volt supply is provided by the towing vehicle when the engine is running and only powers the 12 volt heating element. On the N90 fridge without the LCD display the only way to be absolutely sure that the fridge is running OK when the vehicle engine is running is to check the voltage across the terminals for the 12 volt heating element with the engine running. If 12 volts (usually it will be slightly more than 12) is measured then everything should be OK assuming the heating element is OK. If 12 volts is measured and you suspect the fridge isn;t working, then checking the resistance of the heating element with the power off and the element disconnected for testing will confirm if the element is OK or not. The resistance reading for the DC heater element should be between 0.93 Ohms and 1.13 Ohms. The reversing light is connected to pin 8 on the 13 pin plug and right next to it pin 9 is the permanent feed for the leisure battery circuit. So my first guess is there is a stray strand of wire bridging these two. I’d check the towing socket on the vehicle, put a voltmeter positive on pin 8 (reversing light) and the negative lead on pin 3 (earth for road lights).. if it reads 12 volts or more, the problem is in the towing socket. To check the caravan plug, switch a multimeter over to Ohm range and take a reading between pins 8 and 9. If it shows less than 1 ohm, the problem is in the plug… or where the multicore cable terminates in the caravan. can someone help ive changed my electrics to a 13 pin and all lights work except the ones on the top sides of the caravan not sure what these are called. I assume you mean the red/white lights on the side of the caravan at the rear… these are known as marker lights or clearance lights. They are usually connected to the same supply as the rear side lights and the front white marker lights. Pin 5 for the left side/marker lights and pin 7 for the right side/marker lights. If all the other lights work as correctly expected and the top lights on both sides don’t I would look to see if there is a common earth for these two lights that has become detached as it would be unusual for both to fail because of a connection problem on the supply side. The earth should be connected to pin 3. The next step would be to remove one of the marker light cover and using a multimeter check the bulb, then check to see if you had a +ve supply to the fitting and an earth return path. Seems unusual both have gone off at the same time, that would make me think loss of earth or loss of +ve for both fittings. Contact 12 was “Coding for coupled trailer” only in the long withdrawn ISO 11446:2002, which specified this contact should be tied to contact 3 in the (trailer) plug for detection purposes. Contact 12 is “Reserved for future allocation” in ISO 11446:2004 and ISO 11446-1:2012. So far as I am aware, few if any vehicles attempted to use contact 12 to detect a trailer is connected and no new vehicle should be attempting to do so considering how many years have passed since ISO 11446:2002 was withdrawn. Vehicles that try to detect a connected trailer use a microswitch in the 13 pin socket housing that is operated by inserting a plug and/or when bulb failure detection pulses on the lighting lines show trailer lighting is connected. The standard core insulation colours are found in ISO 4141-3 (the latest version at this time is ISO 4141-3:2006). It is debatable whether specifying vehicle electrics are “fully ISO 11446-1:2012 compliant” is sufficient to ensure all 12 contacts with an allocated function are connected. The standard gives the “contact allocation” (see section 1 of the standard if you have sight of a copy) but does not appear to specify that every contact must be wired as allocated in a vehicle socket. To my reading of the standards, a vehicle installation that omits one or more of contacts 9, 10, 11 and 13 is still ISO 11446-1:2012 compliant, including the requirements of ISO 4091 incorporated by reference via section 6 of ISO 11446-1:2012. An installation is definitely not ISO 11446-1:2012 compliant if any of the contacts are connected in a way that conflicts with the standard, such as pin 10 incorrectly being permanent +12V. I suggest anyone who wants vehicle electrics to include switched and permanent power circuits in addition to the lighting circuits specifies “all 13 contacts (other than contact 12) in the vehicle socket to be connected in accordance with ISO 11446-1:2012”, which is unambiguous. Having taken delivery of a new Hyundai Santa Fe with a OEM wiring kit I found that the fridge was apparently not working. The response from the dealer is that the smart charging system on the car only allows power to the fridge in certain charging circumstances and although it’s wired(say them) may not power the fridge at all times. Later I also found that the ATC doesn’t always come on( I put meter on 9 and 13 pins which appeared to be dead) but a few minutes after reconnecting the ATC came on, giving a bit of credence to the smart charging only allowing power to aux circuits when it feels like it. All the connectors on the car socket are wired at the socket end but it’s difficult to know in what capacity they are being fed. The Hyundai dealer said that this smart charging is common on new cars but I can’t find anywhere that says it will give the problems that I’m experiencing. There are a number of issues with Euro 6 engines, regen braking and alternators in ‘idle’ mode. I thin this article I wrote back in July 2014 might just be the answer. This was for a car trailer with a battery that powered a motor mover and another that powered a winch for loading the car onto the trailer, but the design is very suitable for your application. From a subsequent follow-up email, the gentleman concerned said the whole electrical install cost him less than 50 Euros including a waterproof box and all the fittings. With a bit of modification, it would be easy to adapt for your situation. Let me know if it looks like it would be suitable. Thanks Simon. Looks like some wizard circuitry there. I’ll show this to my towing “specialist” and see where we go although my requirements are somewhat simpler than the conundrum you had to devise an answer to. 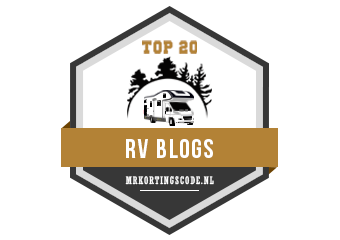 My initial thoughts are that my motorhome is already equipped with a split charging system and so why can’t the pin 10 connection be tapped from the motorhome’s split charger to feed the battery on the tow car? I can’t see any reason why the leisure battery charing circuit can not be simply routed to charge the vehicle battery. However, you will need a relay that is activated by the fridge circuit so that the towed vehicle battery is only in circuit when the motorhome engine is running. If you don’t have this relay, when you hook up the towed vehicle, the battery will be linked to the motorhome immediately and when you start the motorhome engine, the towed vehicle will try to provide some of the current… this will blow the fuses (max rating 20 Amps). One thing to bear in mind is that a 13 pin socket has to be tested as part of the MOT which includes a function test on a standard MOT test set. If you do anything non standard you might find you get a MOT fail. I have had a number of readers get fails even though the 13 pin socket was functioning correctly but the MOT test sets seem to have problems with newer vehicles that are now having their first MOT’s. Obviously if you are not UK based this won’t affect you. Hi there. I have a 2010 Saab 93 and have recently fitted a tow bar with a dedicated wiring harness for a 13 pin socket. I have voltage readings for pins 9 & 10 & the 3 -ve pins (13, 3, 11) are showing a good connections to the car’s earth. However, I am getting no readings at all on the pins for road lights, indicators, brake lights, and fog light. The supplier of the wiring has said that I should try using an analogue multimeter rather than the digital one I have (!!?? **), and that I should connect up to my caravan and see what happens (my caravan is in France!). I have a trailer board which I have connected via a 13 pin to 12N & 12S “splitter” but this does not work. I have rigged up a connection between pin 12 and pin 3 on the plug for this trailer board, but with no effect. The car’s electrics are working fine and I have checked all the fuses which may be part of the trailer circuitry. Any thoughts about what can I try next?? I think that on Saab’s there was a connector that was pre-installed in the vehicle when it was built to allow towing electrics (road lights) to be installed easily with the correct wiring kit. I think that what may of happened is this connector may have come unplugged so the trailer road lights don’t work. The earth connections are usually separate leads and the installer connected these to a ground stud in the vehicle. I’d trace the cable from the socket into the rear of the vehicle and see if you can find this connector where it should plug into the vehicle wiring loom. It is usually hidden behind some of the trim panels in the rear of the vehicle. Thanks for this Simon. I had found the connector that you refer to, and I have established that the connections here are good and I get voltage readings at the relevant fuseways just prior to this connector. Since writing my original question, I researched some of your previous answers on other peoples scenarios and eventually put a load (a 21w bulb) across sockets 9 & 13 and hey presto I get readings on the sockets for lights, indicators etc. However, these only show 8 or 9 volts. Is this a problem? By the way, your piece on checking of 13 pin installations is excellent – really clear & straightforward. * or 9 volts will still light the bulbs… however they won’t be as bright. Something that you might want to try is changing over the filament bulbs in the caravan rear lights to LED ones. I’ve done this and they are so much brighter. Make sure you get quality LED ones that are OK to use with CANBUS. I’ve just come across this site an was interested to read that VW have issues with 13 pin electrics, I have an 2018 VW Amarok and am having issues with the fridge not running when towing (this was the same on my previous Amarok) – as its new and fitted by the main dealer I have asked them to sort it out – so far with limited success as they do not have any wiring diagram. That have put through a technical request to VW. Is there anything I can to to get it working? Thanks for that – Surprised that the main dealer didn’t know! is there any issue if the Caravan is towed by a vehicle that doesn’t have the regen breaking?? Amarok dealers are commercial vehicle dealers and are more used to installing 7 pin tow packages for builders plant trailers, caravan electrics are a bit unusual for them. I have towed out caravan with our 2006 Land Rover Freelander without any problems at all and still got all the benefits of the Wildside unit. Hi Simon, I have just stumbled upon this site, interesting informative explanations, great, thanks. My suspicions that my recently fitted towbar with “dedicated wiring kit” was not suitable to supply the caravan fridge. The voltage sensing relay kept cutting out while cruising and pulling back in when lifting off the accelerator. Your explanation of the energy recovery system confirms this. In my case the vehicle is a 2017 Vauxhall MokkaX. I contacted Vaux technical help, (very, very helpfull), and they confirmed the use of this technique by Vauxhall giving an explanation, as yours to Nigel. The relay fitted was the old faithful “Tec3” VSR type. I removed this and fitted a standard 30amp auto relay using a non-invasive, (to the vehicle wiring, thinking of warranty), to activate it when the engine is running. This energy recovery system was news to me so for interest I Googled “vehicle energy recovery”, a few vehicle manufactures describe their systems, I haven’t found a Vaux one yet!! Vauxhall may not use energy recovery as some others do as they may use smaller alternators and normal sealed lead acid batteries (energy recovery systems normally use AGM Lead Acid batteries as they can accept a higher charge current) for fuel saving.